You carry a pistol every day because you never know what’s going to happen. Doesn’t that mean your ammo should be ready for anything, too? 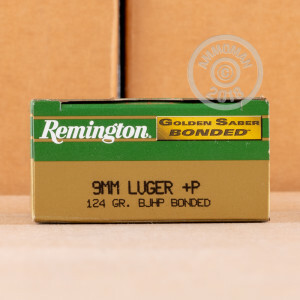 If it’s this 9mm +P round from Remington’s Golden Saber Bonded line, then it is, because its 124 grain projectile’s lead core and brass jacket are hot bonded to one another and therefore capable of blasting through plywood, auto glass, thick fabric, and drywall alike without losing much of their combined weight or forfeiting their ability to neutralize a threat. 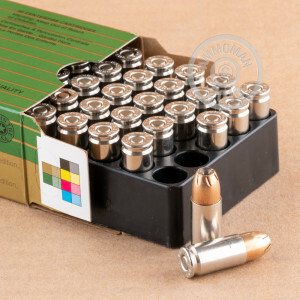 This bullet’s jacket is made of brass instead of copper, the thickness and stiffness of which ensures optimal penetration while minimizing the the risk of overexpansion from occurring. This bullet doesn’t require as much energy to expand during penetration as another comparable one would, and because its nose diameter is smaller it aligns better in the bore for superior accuracy. 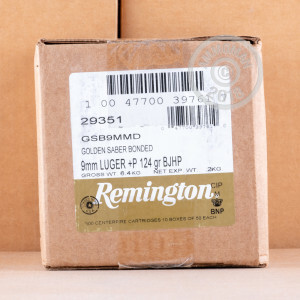 Remington thoughtfully gave this round a nickel plated brass casing, so it will feed and eject reliably and is less likely to be compromised by water corrosion. It’s also shiny, which makes performing a chamber check in the dark require less of your precious time. Do take note that this is +P ammunition, so you’d better only use it in a pistol that can take it or you might never play the violin again.